Plexiglass Sheets, Fiberglass, UHMW, Polycarbonate & Engineering plastics: Plexiglass smells like a dead animal? Plexiglass smells like a dead animal? WTH? Plexiglass smells like a dead animal? In all the 44 years in plastics I have experienced some crazy calls.This is heresy. Plexiglas smells? Well, when you cut freshly made acrylic it DOES have a fragrance - the PMMA is kinda sweet but not like a dead animal. 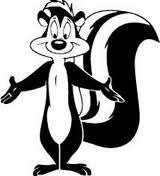 Or a skunk. This is the part where I kneel down and say.... "I love the smell of PMMA in the morning.... it smells like....business!" And then I remembered a noxious smell from my first days on the job in 1968 - counting inventory as a 14 year old. I was told to count the celluose acetate butyrate materials. The closer I got, the more sickening the odor of something nearby. I grabbed the butyrate tubing and took a whiff. "This smells like dog poop" I exclaimed to the others. "The new guy always has to count that stuff" they said. So it turns out that CAB (the acronym) for cellulose acetate butyrate is the Pepe LePU of the plastics industry.